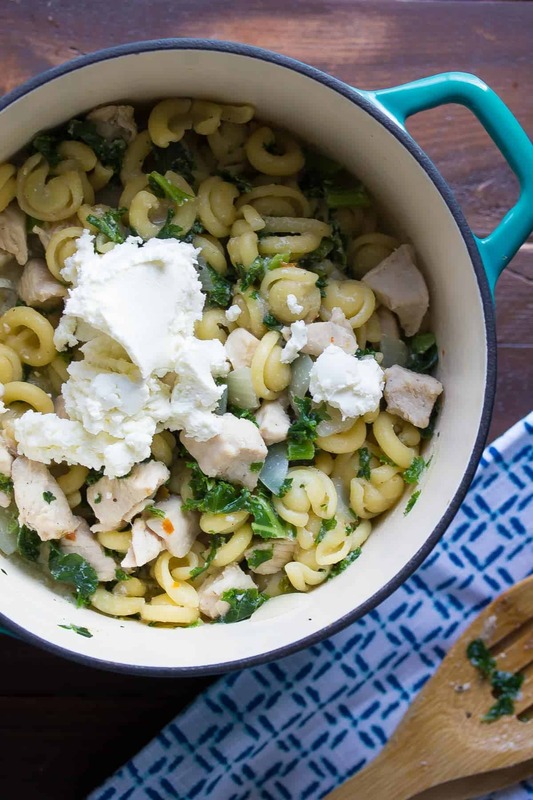 This one pot pasta with kale and goat cheese uses some easy short cuts to get dinner on the table in 30 minutes, using only one pot! 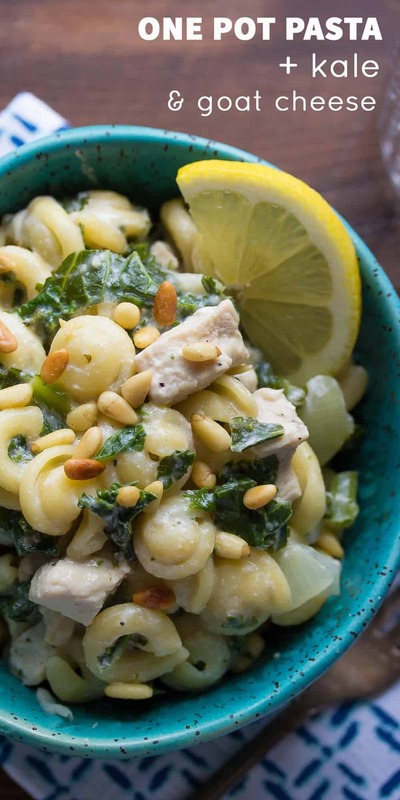 Chicken and kale get a flavor boost from creamy goat cheese and pine nuts! And just like that, it’s February! Is it just me, or did January fly by? I am totally OK with that, because I’m already dreaming about spring flowers and warmer weather. I used to be a ‘winter’ person, but now that I have a toddler, I am definitely more of a ‘summer’ person. Toddlers are highly prone to cabin fever. While I’m OK to curl up and read a book on a cold day, Kai wants to go to the park, run around and climb on stuff. And when he can’t climb on ‘park’ stuff, he will climb on everything else in the house. So. I’m currently dreaming of warmer weather, and after-dinner walks to the park. And I’m adding this creamy and dreamy one pot pasta with kale onto the list because it’s pretty dream-worthy! I’m excited because today I am partnering with Cookin’ Greens, a Canadian company that produces high quality frozen leafy greens. 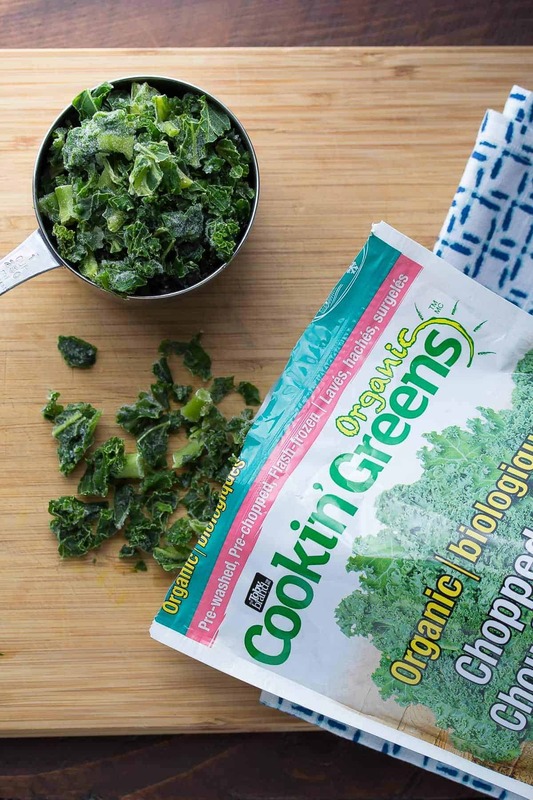 What sets Cookin’ Greens apart is their approach to generating such a quality frozen product. 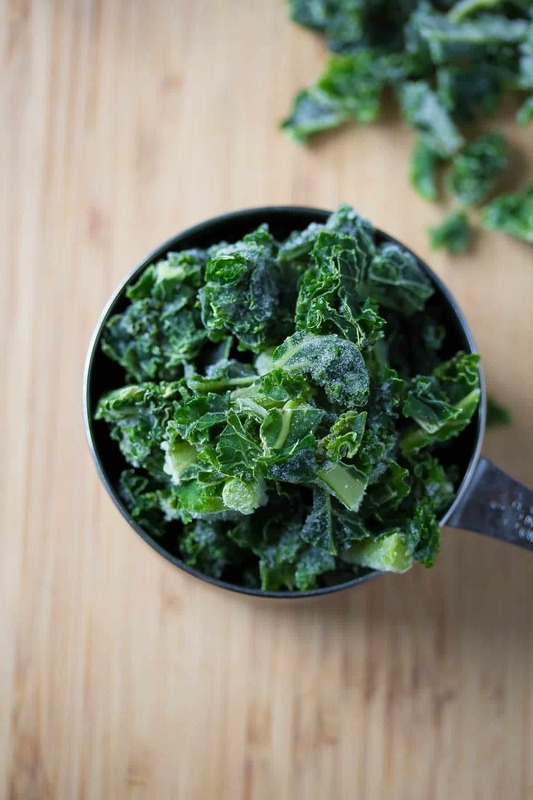 Because the greens (kale, spinach and more) are flash frozen within hours of harvest, they arrive to your freezer with a higher nutrient content than the fresh greens you might buy in the store. Not only that, but they are so much easier to cook with than some frozen products because they come out of the package as individual leaves, not a giant clump. And can I just say…you can really taste the freshness. It is unlike any other frozen greens product I’ve ever used. For this recipe I used the Organic Chopped Kale (although you could easily sub Cookin’ Greens Organic Spinach or other organic blends), and it definitely made dinner a lot easier: no washing, no chopping. Just throw it in the pot and you’ve added a big boost of nutrition to your dinner! This was originally going to be one pot pasta with kale and ricotta, but it was pretty bland. So I decided to amp things up with a little goat cheese! You could easily sub cream cheese if goat cheese is not to your taste. This recipe is SO easy. You don’t even have to pre-cook the chicken or the onion! Throw it all in the pot, cook till al dente, add the frozen kale and lemon juice, and finally stir in the goat cheese. It’s all ready in 30 minutes, and only dirties one pot! 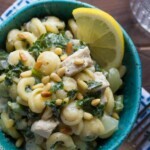 I love the combination of the kale, goat cheese and lemon…they go so well together! 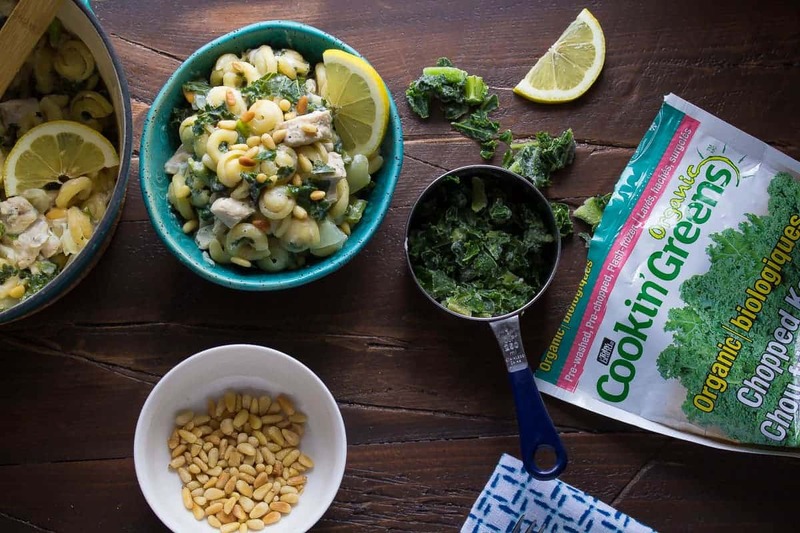 Be sure to check out the Cookin’ Greens Store Locator to find out which store near you carries their product! Disclaimer: Thank-you to Cookin’ Greens for sponsoring this post. Thank-you for supporting the brands that help bring you Sweet Peas & Saffron. As always, all opinions are my own. An easy weeknight dinner that cooks up all in one pot and is on the table in 30 minutes! 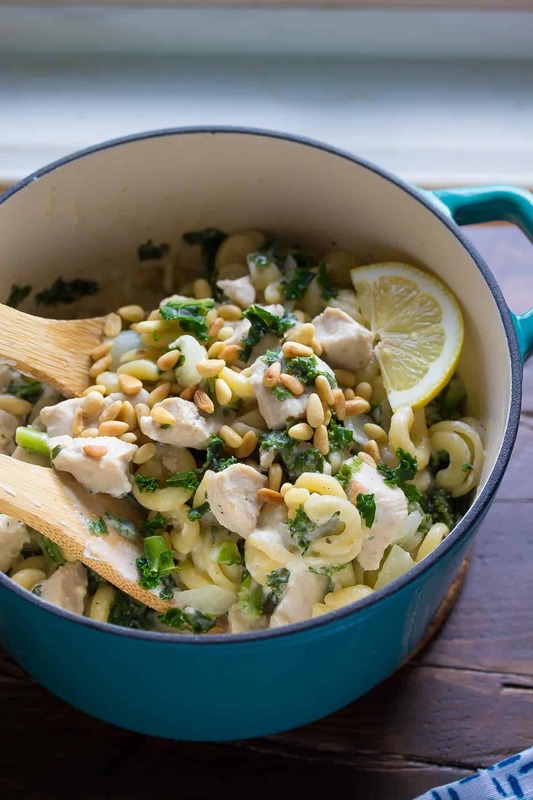 This pasta contains creamy goat cheese, lemon, pine nuts, kale and chicken. 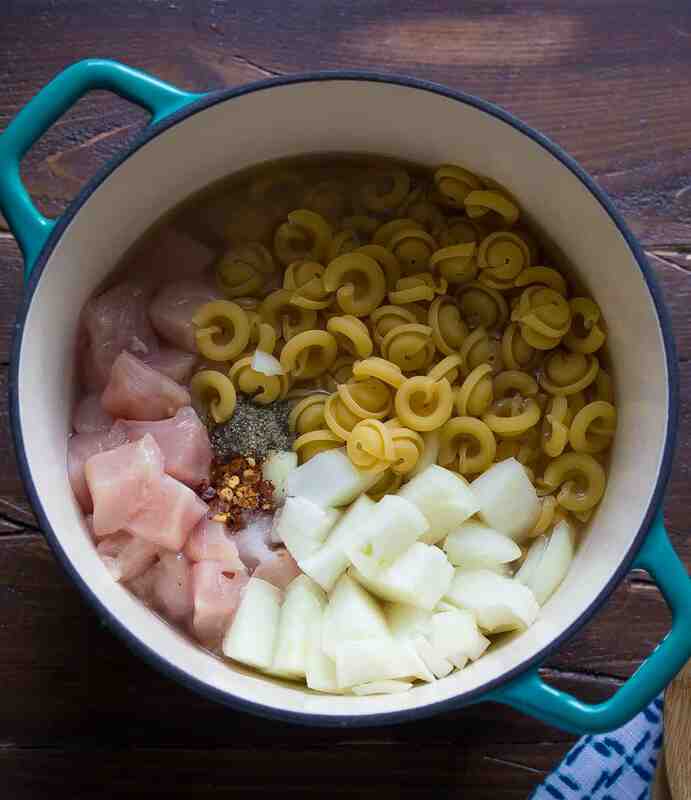 In a medium pot, combine the pasta, chicken stock, salt, pepper, red pepper flakes, chicken breast and onion. Cover the pot, bring to a boil, reduce heat and simmer for 10 minutes, stirring ever 2 or so minutes. At this point the pasta should be al dente. Stir in the lemon juice and Cookin Greens Organic Chopped Kale. Cook, uncovered for 2-4 more minutes, until kale is thawed. Stir in the goat cheese until melted through. Serve immediately, garnished with pine nuts. I’ve been surprised to see spring flowers and blossom over this last week – spring is coming! In the meantime, I’m all for easy one-pot meals. I’ve never tried a one-pot pasta meal, but now you’ve definitely got me thinking about it. I’m not a fan of goat cheese, but hey, cream cheese would be fabulous! Us too! I’m just ready for some park weather 😉 THanks, April! love love love this one pot pasta!! and hooray for Cookin’ Greens! gotta get those high quality frozen leafy greens!!! love this! Thanks, Cyndi! I don’t know about 115F heat, that’s crazy hot!! Oh I used to like winter too, but now that I bought a house I just find winter too stressful. Shoveling, cleaning the roof so it doesn’t collapse, etc. GAH. This one pot pasta is so dreamy – anything with goat cheese totally steals my heart. And I LOVE that the greens come frozen as individual pieces. I hate those big frozen blocks that other companies are known for. It’s just weird and wrong. Aaahhh shovelling 🙁 My least favorite is scraping the windshield!! Thanks, Liz! I am starting to get a little cabin fever myself. I go on a walk with Josh every day, except when it’s raining. On rainy days, I miss being outside! Almost time for spring, woo hoo! This pasta sounds delicious! I can’t believe it’s already February! Although I’m glad because I hate winter and just want to fast forward to about May! 🙂 This pasta looks delicious! I love the addition of goat cheese! Gosh, does this look good. 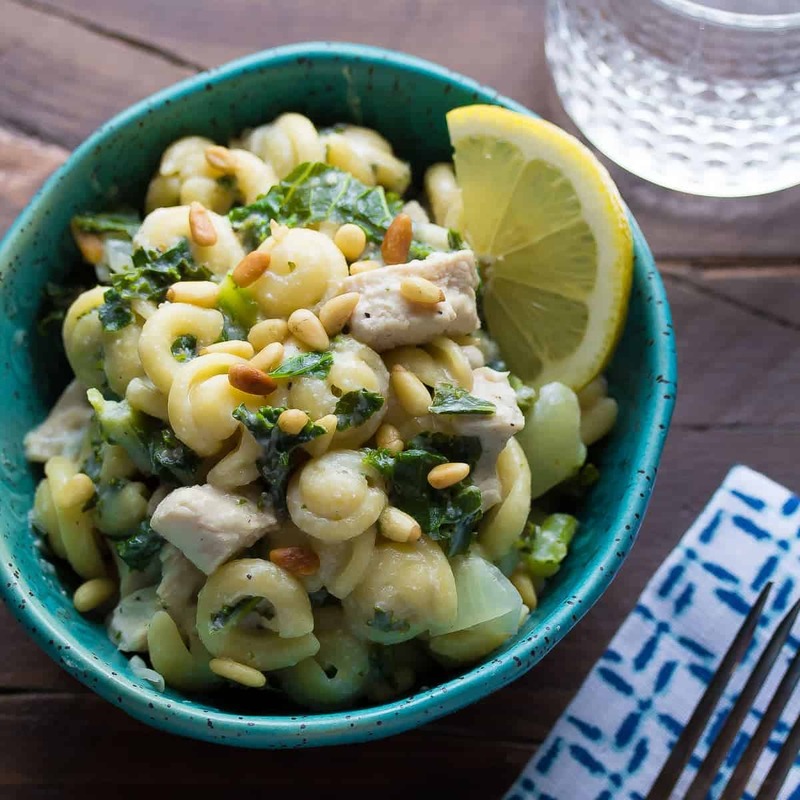 Pine nuts just make any pasta dish amazing. I love how easy this is– definitely going on my to-do list! Winter time is hard with a toddler, but luckily it gets easier when they’re older (it goes by SO fast)! 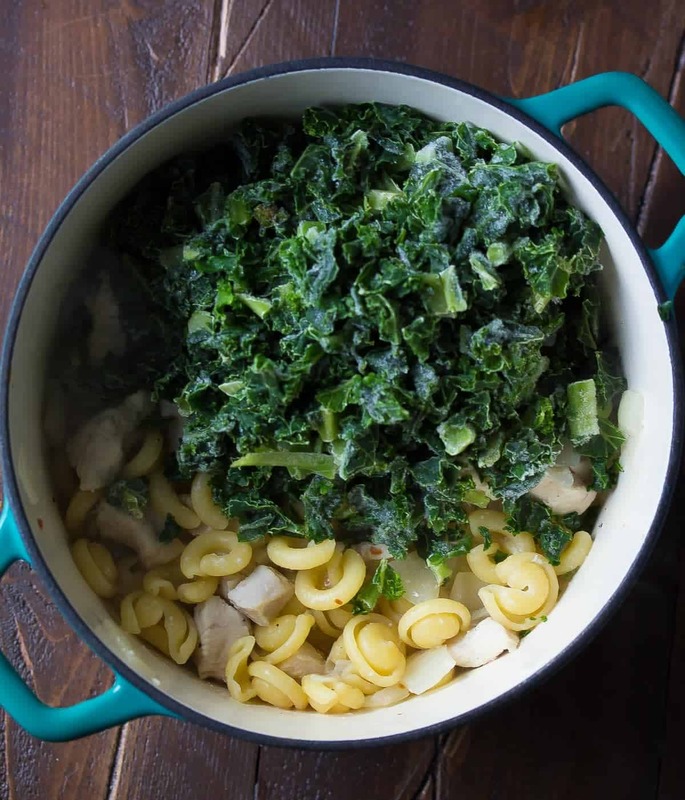 This looks like one big pot of comfort food, and those greens sound perfect! I’m loving these flavors, Denise, and I’m definitely going to try this! I am loving this winter.. but mostly because it is my first winter living outside of FL and I have no kids. 😉 Also LOVING this one pot pasta wonder! The flavors in here are delicious and I adore that you amped it up with goat cheese! YAHHHSSS! I want to stay in my jammies and snuggle up with a few bowls of this! Cheers, Denise!